Harvard University student Elana Simon introduces President Obama before he spoke at the White House Friday about an initiative to encourage research into more precise medicine. You may soon be able to donate your personal data to science. There are plans afoot to find 1 million Americans to volunteer for a new Precision Medicine Initiative that would anonymously link medical records, genetic readouts, details about an individual's gut bacteria, lifestyle information and maybe even data from your Fitbit. The idea is that medical science can learn a lot more about diseases if researchers can tap into a wide spectrum of information about people who get sick and those who stay healthy. Medicine has been moving haltingly in that direction. For example, some cancer patients get a genetic test to help doctors identify the best drug to treat their particular subset of tumor. A National Academy of Sciences report in 2011 suggested that there's vastly more potential here for understanding and treating disease. And that idea has taken hold. Today President Obama asked Congress to fund a $215 million initiative, which would build around those million volunteers. Participants would be assured privacy, and they'd also have a say in how the overall effort is designed. 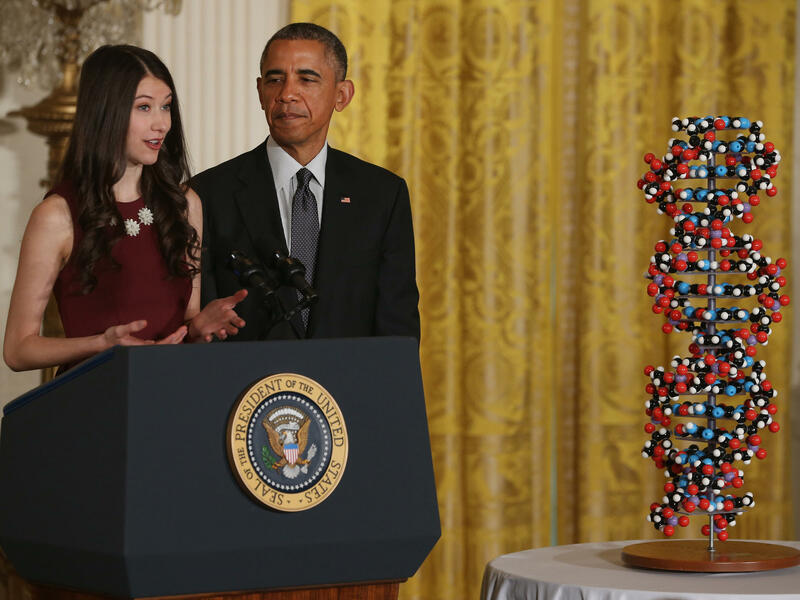 "Ultimately this has the possibility of not only helping us find new cures, but it also helps us create a genuine health care system as opposed to just a disease-care system," Obama said at a White House ceremony Friday. "Part of what we want to do is to allow each of us to have sufficient information about our particular quirks, that we can make better life decisions. And that ultimately is one of the most promising aspects about this. " Don't expect this to happen overnight. When this idea was a gleam in the National Academy of Science committee's eye, the scientists said this idea would take decades to mature. There are already efforts afoot to bring together medical data to advance research. The i2b2 center at Partners HealthCare System in Boston is one federally funded effort to integrate medical records and genetic information on a large scale. Kaiser Permanente in Oakland, Calif., also collaborates with University of California, San Francisco in a similar effort. A sample of a million volunteers across the United States could expand that effort – helping to connect the dots between diet, environment, genes, behavior and health. That could help guide more effective disease-prevention strategies and it could help improve treatment in people who do get sick. The initiative's immediate focus is on cancer. It seeks $70 million for the National Cancer Institute, to accelerate efforts to understand how changes in the genome can be tapped to improve cancer treatment. Another $10 million would go to the Food and Drug Administration to help it grapple with approving tests and drugs based on these new approaches to medicine.